We will be closed April 19th in observance of Good Friday. Happy Easter! Day Delivery or Same Day Pick Up. We have two local showrooms for your convenience. You can pick it up today or have it delivered tomorrow. Visit our showrooms or shop online now! We have the largest local selection of premium used furniture. At up to 80% less than the price of new, it is perfect for any size business. Shop our Used catalog today! Our in-house interior designers are ready to measure, space plan & design your office space… all at no cost or obligation to you. 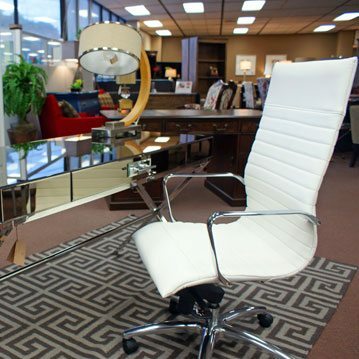 We have two showrooms stocked with quality New and Used office furniture for every budget. Now over 69,000 sq. ft.! No appointment necessary. Monday-Friday, 8:00am – 5:30pm Come See Us Today!